If we have to pay for the sins of December excess in January, then at least let it be with something tasty. These veggie burgers with chopped poblano peppers, onions, carrots, zucchini, black beans, and kidney beans are not the least bit boring. 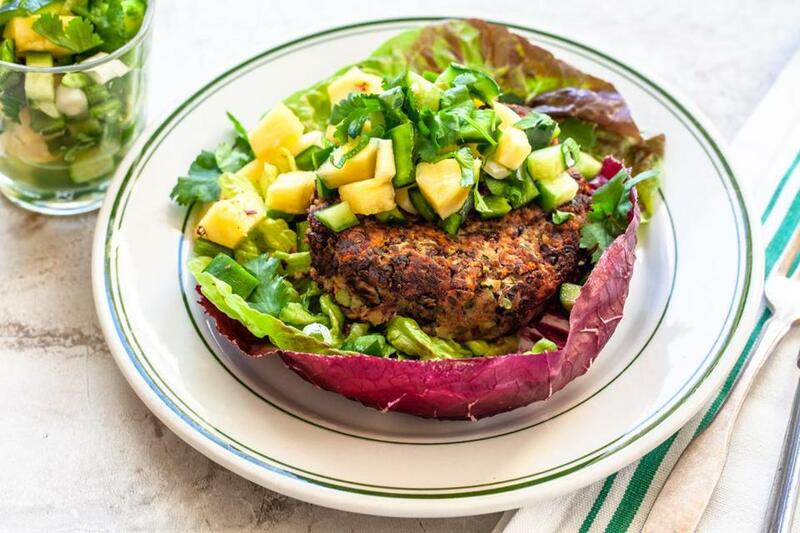 Serve them inside lettuce cups with a refreshing pineapple salsa; they’re filling and appealing and you can feel smug that you kept to your new eating plan. The burgers can be wrapped in plastic wrap and frozen in individual sandwich bags so you can pull one out for a quick meal. Poblano peppers can range from mild to spicy, so taste a piece before you chop it if you don’t want a lot of heat; you can also substitute a bell pepper to avoid extra hotness. Use a food processor for all the chopping, but don’t bother to wash it between tasks to make cleanup minimal. Start by finely chopping the vegetables for the burgers and softening them in a little oil in a skillet. Pulse a slice of bread to make soft breadcrumbs. The canned beans should be rinsed, drained, and spread on paper towels to dry; that way they don’t become a mushy puree in the processor. A few pulses are all you need to chop them coarsely. Cook the burgers lightly in oil, and though they’re nice on buns, there’s virtue in the lettuce cups. Milk your resolution moment. 1. In a bowl, stir together the pineapple, cucumber, poblano, onion or scallions, and cilantro leaves. 2. Stir in the lime and salt. Taste for seasoning and add more lime juice or salt, if you like. 1. In a food processor, pulse the poblano or bell pepper, onion, and carrot until finely chopped. Add the zucchini and pulse again to chop it. 2. In a large nonstick skillet over medium heat, heat 2 tablespoons of the oil. Add the zucchini mixture and cook, stirring often, for 7 to 8 minutes, or until the vegetables soften and most of the liquid has evaporated. Transfer to a large bowl. Wipe out the skillet. 3. Without cleaning the food processor, add the torn bread pieces and pulse until they form soft breadcrumbs. Add to the bowl of vegetables. 4. Line a baking sheet with a layer of paper towels. Spread the beans on it and pat them dry with another paper towel to remove excess moisture. In the food processor (again, don’t bother to wash it), pulse the beans until they are in small pieces, but not like a paste. Transfer to the bowl of vegetables. 5. Stir the egg, salt, and pepper until well mixed. Shape the mixture into 6 patties. 6. In the skillet over medium heat, heat the remaining 2 tablespoons oil. Add the patties and cook for 5 minutes, or until browned on the bottom. Turn and cook for 5 minutes more, or until they are golden on the undersides and hot all the way through. 7. Set two lettuce leaves on each plate. Top each with a burger and a spoonful of salsa.